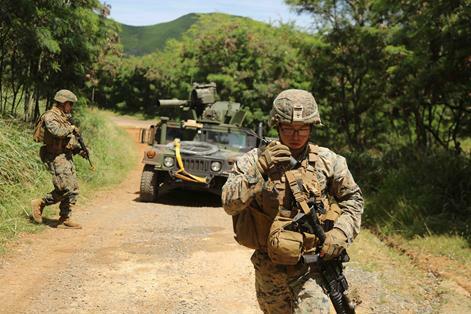 U.S. Marines with 1st Battalion, 3d Marine Regiment conducted combined anti-armor team mounted patrols during Exercise Bougainville I at Marine Corps Training Area Bellows, Hawaii, March 15, 2018. The Marines dealt with simulated improvised explosive devices and ambushes throughout the patrols and were put through a scenario where a simulated IED went off, taking out a Humvee and causing a simulated casualty. The training event is a continuation of Exercise Bougainville I since its start at the beginning of the month. This exercise is an opportunity for Marines to conduct small unit level training to prepare for Exercise Bougainville II and future deployments. The Marines are occupying a simulated Forward Operations Base on MCTAB for the week long training event. The location challenges CAAT, which is designed for anti-armor in a large open environment, allowing them to conduct their training in realistic environments such as jungle and urban terrain. MARINE CORPS BASE CAMP LEJEUNE, N.C. - Cpl. Zachary Taylor instructs a Marine on how to use an M2 Browning .50-caliber machine gun at Marine Corps Base Camp Lejeune, N.C., March 30, 2017. The Marines conducted a live-fire from the turrets of Medium Tactical Vehicle Replacement trucks, as part of a culminating event for the Combat Logistics Regiment 25 Command Post Exercise. Taylor is with the Battle Skills Training School, 2nd Marine Logistics Group. Marines with Combat Logistics Regiment 25 conducted a series of combat convoy exercises at Marine Corps Base Camp Lejeune, North Carolina, March 29 and 30, 2017. The combat convoy was part of a larger event, the CLR-25 Headquarters Command Post Exercise, that lasted two weeks. The exercises were designed to train Marines on scenarios they may encounter in a deployed environment. The Marines that made up the CPX were of different military occupational specialties such as supply clerks, motor transportation operators and maintenance management. “You always have to be prepared for when the enemy attacks. We are practicing immediate action drills for when we find an improvised explosive device, a truck of ours gets hit, and when or if we come across the enemy. We have to know whatto do in these situations; we have to be prepared,” said Pfc. Zachary Goebel, a motor transportation operator with CLR-25. The Marines conducted simulated convoys and also a live-fire drill from the turrets of Medium Tactical Vehicle Replacement trucks with M240B machine guns and M2 Browning .50-caliber machine guns for the culminating event of CLR-25 HQ’s CPX. Marines demonstrated their skills to prove they were ready to perform in real world circumstances. “Exercises like this help with combat readiness because we are always ready, and we are always prepared to strike on the fly,” said Goebel.